Starting off with a salvaged 20mm cannon from an F-16, a lot of work went into getting it working and mounted to one of Toyota’s hybrid electric go-carts. Black Rifle Coffee’s Matt Best teamed up with FullMag’s Richard Ryan to mount the Vulcan on the Prius, seen blasting off in the above video. 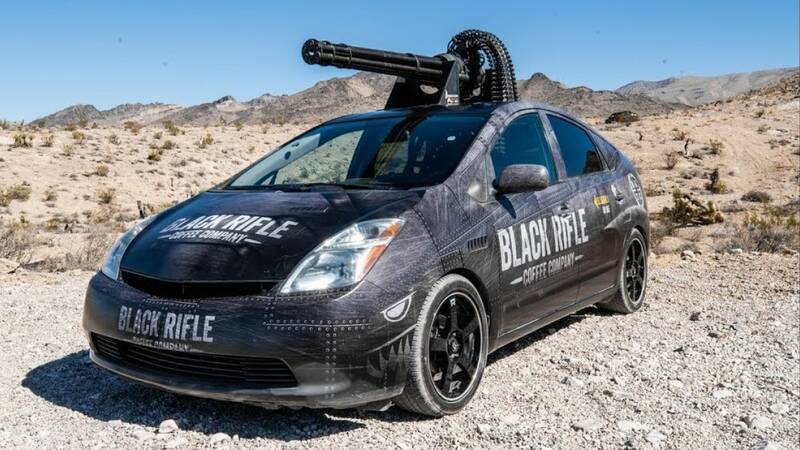 The project, which started in June, took hundreds of hours of work and had some complications to work through, such as gutting the Prius and fabricating a mount. Also, an F-16 has a lot more power to offer to run the electrically-fired six-barreled rotary cannon than what the compact car does, a problem which required an out of the box solution. Plus, the fuel-sipping grocery-getter wasn’t designed to withstand the force of 300-pounds of cannon going off above its roof. Still, they made it happen. To pull it all off, they tapped in Battlefield Vegas as well as big gun experts Pat Hamilton and our buddy Bob Bigando to make it happen. The really interesting behind-the-scenes is below. Oh, yeah, and did we mention that the rounds cost $27 a pop?